This entry was posted	on Monday, October 24th, 2016 at 3:24 pm	and is filed under The Rabo Karabekian Memorial Deathmarch. You can follow any responses to this entry through the RSS 2.0 feed. You can leave a response, or trackback from your own site. I only just noticed that the Library of America edition has notes at the back. These can be very useful when encountering, for instance, a lengthy, untranslated quote in German. Since college, I have sustained a casual interest in medieval history. In recent years, I’ve read both novels and histories about medieval Europe, trying to imagine the experience of living in such primitive but now romanticized times. But before Slaughterhouse-Five I had not heard of the “Children’s Crusade.” If we can believe Wikipedia (??) it is the apocryphal legend of a march of thousands of religiously inspired children who attempted to reach the Holy Land in 1212, with the intent of miraculously converting Muslims to Christianity. Various “historical” accounts all have it ending badly. One famous variation tells that when God failed to open the Mediterranean Sea for children to march through to the Holy Land, they were offered crossing by seagoing traders who then sold the survivors as slaves. The name and core concept of this legend have survived and been retold repeatedly since the Thirteenth Century. Vonnegut, who wrote SH5 in 1969, could have encountered this legend in the 1968 anti-war movie “Gates to Paradise” by Polish director Andrzej Wajda, based on a 1960 story by Polish writer Jerzy Andrzejewski, which drew on the Children’s Crusade legend. “Slaughterhouse” is indeed a story focused on death and the psychological aftermath of war on its survivors. It presents a philosophy of apathetic resignation to death in all forms, repeatedly expressed by the phrase “So it goes.” Does this REALLY reflect KV’s own life and death philosophy? I doubt it….beneath his almost nihilistic cynicism about people and politics beats the heart of a crusading protester. I recall this as Linda Ellerbee’s sign off line when she did TV newscasts. I wonder if she got this from Slaughterhouse? The first chapter of this book remains one of my all-time favorite first chapters. That he chose to write it not as an author’s introduction, but incorporate it into the structure of the novel, adds more poignancy and immediacy to everything that follows. That his struggle to write the book, to make sense of his experience at Dresden (“there is nothing intelligent to say about a massacre”) , is pretty much what the book is “about,” and prepares us for the unstuck-in-time stuff to follow. If nothing makes sense and there’s nothing intelligent to say, then what is the point of anything? Maybe only by looking at the totality of our lives from outside our birth-to-death linear path, from an alien perspective, can we even begin to comprehend why we’re here and if anything actually matters. Seems to me that S5 is formed by two opposing forces at work. 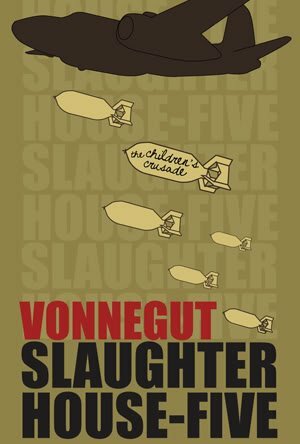 One is Vonnegut’s desire, or is it need, to write about his war experiences. It’s not entirely clear if this is some deep psychological compulsion to work through trauma, or simply a professional writer’s understanding that he has a treasure trove of good material going unused. Probably some combination of the two. On the other hand we have his deep suspicion bordering on contempt for conventional narrative and the role it plays in romanticizing war. This concern is spelled out in so many words right there at the beginning of the book. In Vonnegut’s view a writer can all too easily become part of the machine that allows war to continue by supplying inspirational narrative framework. The challenge then is for him to tell his story without either glorifying war or trivializing the suffering it causes. The Tralfamadorian view of death and constant repetitions of “So it goes” are an attempt, I think, to gain some objective distance, to pull back and take a larger view. Which is funny because Vonnegut is certainly not trying to tell the whole story of WWII; he’s taking a very specific and small-scale viewpoint. Again, two opposing forces at work. “The Dresden atrocity, tremendously expensive and meticulously planned, was so meaningless, finally, that only one person on the entire planet got any benefit from it. I am that person. I wrote this book, which earned a lot of money for me and made my reputation, such as it is. This is my first time reading S5. As I progressed through Ch.1 I kept wondering if V was ever going to get to actually talk about the “un-talkable” and how he was going to do it. Transitioning to the “Billy Pilgrim” personna who becomes unstuck in time and looks onto the scene from outer space is brilliant. Also, the need to shift in time incessantly reminds me of Patrick Modiano’s human memory work as it relates to remembering WWII events in Paris. Like reading a kaleidoscope. Sparkly delights with an ever-present sense of vertigo. Not sure how effective it is as anti-war statement. I kept getting pulled out of the narrative flow by one thing or another. So far the most mature work. More assured than the others. Carry on. I did wonder about it being an early example of postmodernism with that nice meta-persona aspect of the first chapter/introduction. And I was curious how much of this was his real experience (not that the author matters or things like that). But I will definitely be checking out that link to hear his comments on it. This book reminds me of how masculine a writer KV is. There’s nary a girl to see.